If Viktor Yanukovych were to sign the EU agreements as they stand, the economy would suffer and he would probably lose to whichever rival candidate arch-foe Yulia Tymoshenko gives her backing in 2015. Is there anybody left in the Eurasia-watching community in the West that has not condemned Ukraine for suspending preparations for agreements that would have taken closer into the EU’s fold? Until recently this community had expected Ukrainian president Viktor Yanukovych to enter history as "the man who has brought Ukraine into Europe" by signing the Association Agreement (AA) and Deep and Comprehensive Free Trade Agreement (DCFTA) at the two-day Eastern Partnership summit in Vilnius this week. But that was thwarted, as many Western experts have it, by “imperialist” Russia strong-arming Ukrainian President Viktor Yanukovych into an 11th hour about-face. The decision has created a backlash in Ukraine, where the parliamentary opposition now wants Yanukovych impeached for state treason. Thousands of protesters have hit streets of Kiev in a pitch to force a change of mind in their president. As a recent poll shows, even 47 percent of supporters of Yanukovych’s Party of Regions support Ukraine’s association with EU. So why would a leader up for re-election in less than 15 months from now balk at granting the wishes of his own constituents? Should he not at least have put this issue of tantamount importance to vote in a referendum? The short answer is: It’s the economy, stupid. Russia imports more goods from Ukraine than the entirety of Europe, according to the Ukrainian government, while supplying almost two-thirds of gas that Ukraine consumes. Many of these goods are produced in eastern Ukraine, which together with Crimea, represents the power base for Yanukovych and his supporters. Russia has already made it painfully clear that the billions that the Ukrainian economy has already lost because of recent trade restrictions introduced by Moscow will only be the beginning if Kiev signs the AA and DCFTA. EU officials claim Russian officials told Ukraine that introducing EU requirements would have cost as much as $100 billion, while Russia cutting off trade and imposing other restrictions on Ukraine would have hurt the country to the tune $500 billion, Reuters has reported. And even though the EU knows Russia would punish Ukraine economically, it has shied away from offering a comprehensive package to compensate for Kiev’s potential losses. But suppose Moscow didn't act on its national interest in anchoring its post-Soviet neighbours. Let's also imagine that Moscow would for some reason keep in place trade perks favouring Kiev, even though that would mean its producers being exposed to EU goods re-exported onto the Russian market through Ukraine. 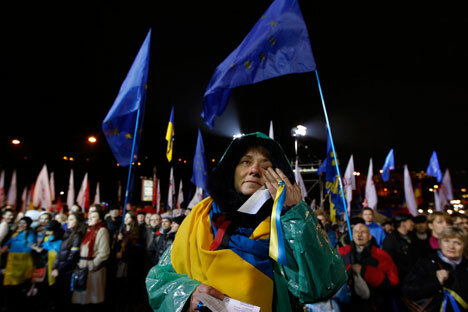 Even then Ukraine could still not afford westward integration on the terms the EU is offering. By Yanukovych’s assessment, Ukraine needs $160 billion to shift to European standards by 2017, as required by the proposed agreements with EU. Yanukovych is most probably exaggerating, but even if the cost was 10 times smaller, it would still be a hefty sum for a nation that is set to run a budget deficit of more than $6.5 billion this year. On top of that, the IMF is reportedly refusing to issue the loan that Ukraine needs to prop up its economy, unless Kiev doubles gas prices for consumers. One has to ask, would leaders in the EU double gas prices for their population and divert billions of dollars needed to pay pensioners and public servants to spend on reaching somebody else’s expectations only a little more than one year before an election? Loss at the February 2015 presidential elections for Yanukovych would not just mean an end to his tenure, but also the loss of his and his allies’ business assets and possible jail time. After all, that’s what he has subjected former Prime Minister Yulia Tymoshenko to. Why should the next leader of Ukraine treat him any differently? If Yanukovych were to sign the EU agreements as they stand, the economy would suffer and he would probably lose to whichever rival candidate arch-foe Tymoshenko gives her backing in 2015. Having lost part of his core supporters over the pain inflicted on Ukraine's economy and budget by a combination of Russia's punitive measures and costs incurred by bringing Ukraine's standards in line with EU's, the incumbent would still fail to win enough voters among the pro-Western crowd, who largely hate his guts. In short, the Ukrainian president’s decision to suspend the EU drive is the rational choice of a politician concerned with his own survival. In contrast, if Yanukovych were to enter Ukraine into the Russian-led Customs Union, he could at least count on enough loans and gas discounts from Russia to prop the economy up long enough to win the 2015 election. And yet Yanukovych knows from experience that siding with Russia, which seeks to anchor Ukraine to itself, has its disadvantages. Upon his inauguration in February 2010, Yanukovych undertook a number of steps to accommodate Russia. These included cancellation of his predecessor’s campaign for recognition of the Holodomor famine of the early 1930s, suspension of Ukraine’s drive for NATO membership and an agreement to extend the stay of Russia’s Black Sea fleet until 2042. His hope for now must be that the trilateral talks between EU, Russia and Ukraine that he has proposed will allow him to somehow integrate into the Western European economic space while preserving the perks of trading with Russia. Whether, however, EU and Russia will continue put up with Yanukovych playing them off one another is another matter. Simon Saradzhyan is a researcher at Harvard Kennedy School's Belfer Centre.